B-Human is currently one of the best teams in the RoboCup Standard Platform League and won the world championship six times, the RoboCup German Open eight times in a row, and the RoboCup European Open once. It is a collegiate project at the Department of Computer Science of the University of Bremen and the DFKI research area Cyber-Physical Systems. B-Human is a collegiate project at the Department of Computer Science of the University of Bremen and the DFKI research department Cyber-Physical Systems. 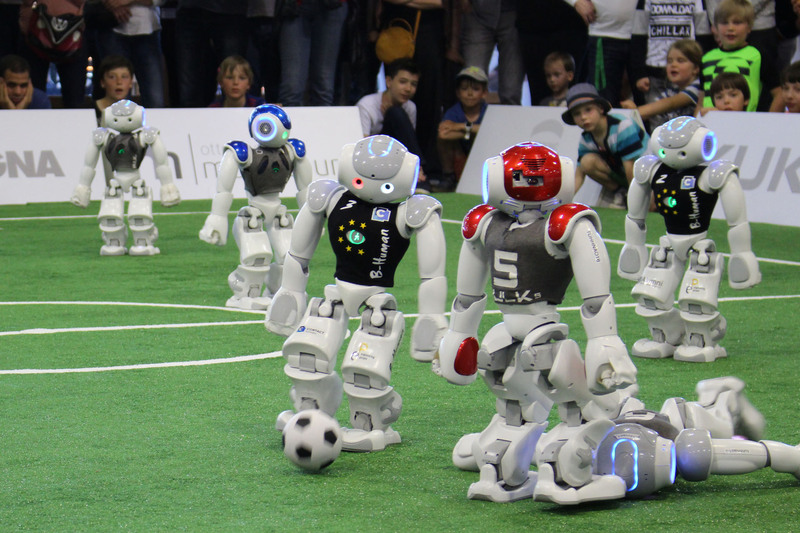 The goal of the project is to develop suitable software in order to participate in several RoboCup events and also to motivate students for an academic career. Our team consists of students and researchers from the University of Bremen and the DFKI. 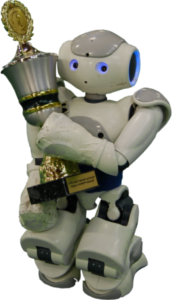 The RoboCup is a fascinating combination of innovative research and the most popular team sport. We participated in the Humanoid League until we entered the Standard Platform League in 2008. Since then, we participated in the German Open, in the European Open, and in the RoboCup world championships. B-Human is currently one of the best teams in the RoboCup Standard Platform League and won the world championship six times, the RoboCup German Open eight times in a row, and the RoboCup European Open once. Our work is not only for fun but also covers serious research topics. After a winning streak between 2009 and 2011, whereby we won the world championship three times in a row, we became vice world champion in 2012 in Mexico City. In 2013 we successfully reclaimed the world champion title in Eindhoven and lost it again in 2014 in João Pessoa, where we became 3rd. We became second in 2015 in Hefei (China). At the RoboCup European Open 2016, which took place again for the first time after 16 years, we became European champion. We also reclaimed the world champion title in the same year in Leipzig. In 2017 we won the German Open in Magdeburg and successfully defended our world championship title from 2016 in Nagoya. Our team is dependent on financial support of sponsors in order to keep our work alive and being able to take part in further international competitions. If you are interested in supporting us, please visit our sponsoring page for more information. Shot and... Goal! Cheering outside the field. Surprisingly, it's not proud parents of young football players cheering. 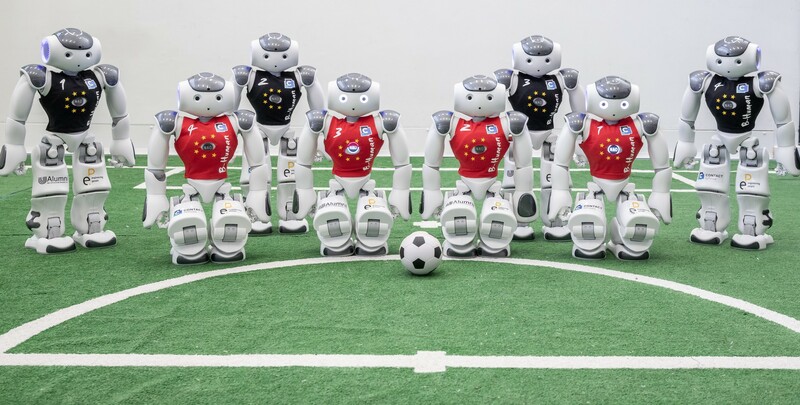 A dozen of knee-high robots are playing football against each other. What was that? Foul! One of the plastic buddies is going down with a stoic innocent look. It is comical to watch. But what's behind all this: a lot of work and many years of research that have gone into it. Scientists are trying to follow the humans' example. Exactly there lies the appeal. Human beings learn to orientate themselves and to move throughout their entire life. Teaching a robot these skills is a highly demanding task. Everything that is normal to us - let it be recognizing the ball or moving one foot after the other - is absolutely not trivial for a bundle of cameras, motors, and circuits. Again and again we realize through the work with robots how complex these events are and about the limits of technology. The robots' tasks are diverse. First of all, they need to orientate themselves in their surrounding to know where the goals are and in which one they have to shoot the ball. Many clues are being analyzed, e.g. the field's lines. If one player is unsure where he is, they all communicate among each other. It is even possible to change one player's mind. While the goal is clear, they also have to figure out the way. A robot constantly has to decide between several options: Which way do I take? When shall I shoot? Decisions that highly influence the result of the game. Developments in this field of research are terrific, fast and exciting. And they can be observed by spectators. From bachelor students to graduate students studying for a doctorate, there are many topics: reaching from the recognition of objects to balanced movements. Success and results can be seen and measured at competitions that regularly take place at exhibitions and fairs - they definitely are a crowd puller.